Sliced potatoes are baked in a luscious, golden cheese sauce until tender and delicious! Parboiling the potatoes briefly before baking ensures that the potato slices cook evenly in the gratin. Peel and thinly slice the potatoes (about ⅛-inch thick). A mandoline works great for this, but watch your fingers! Place the slices in a large pot of salted water (2 teaspoons of salt is sufficient) so they do not oxidize (turn brown). After all the potatoes have been sliced, bring the water and potato slices to a boil over high heat. As soon as the water begins to boil, set a timer for 1 minute. Immediately remove from the heat and drain the slices in a colander. DO NOT rinse with water! The potatoes will continue to cook slightly as they cool in the colander. Drain well and then place the slices on several layers of paper towels or a clean lint-free kitchen towel on your work surface. Pat them dry with additional towels. Prepare the cheese sauce and keep warm over low heat, stirring occasionally. Next, “butter” a shallow casserole dish with the butter. Place a layer of potato slices in an overlapping pattern and season lightly with salt and pepper. 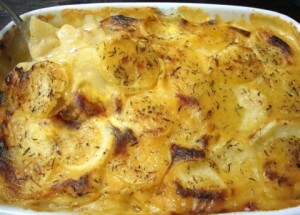 Spoon a little of the cheese sauce over the potatoes and spread evenly. carefully so they do not burn. Remove from the oven and serve. Process the ingredients in a blender until smooth. Please note that the light golden color will develop as the cheese cooks. Transfer to a medium saucepan and cook the mixture over medium-low heat, stirring slowly and continually with a silicone/rubber spatula. As the mixture begins to form curds, stir vigorously, scraping the sides and bottom of the saucepan with the spatula as you stir. Keep stirring until the mixture becomes bubbly, smooth and glossy. Taste and add salt as desired and/or additional soymilk to lighten the consistency to your preference. Reduce the heat to low to keep warm until ready to serve. Stir occasionally. The sauce will thicken upon cooling. If you’ve ever been “on the fence” about tofu because of its texture, these spicy nuggets may just change your mind. They’re pre-baked to give them a dense, meaty and slightly chewy texture before breading and frying. I’ve often heard that people have a difficult time getting breading to actually adhere to tofu. So I experimented with a batter that seems to work rather well. And voila! 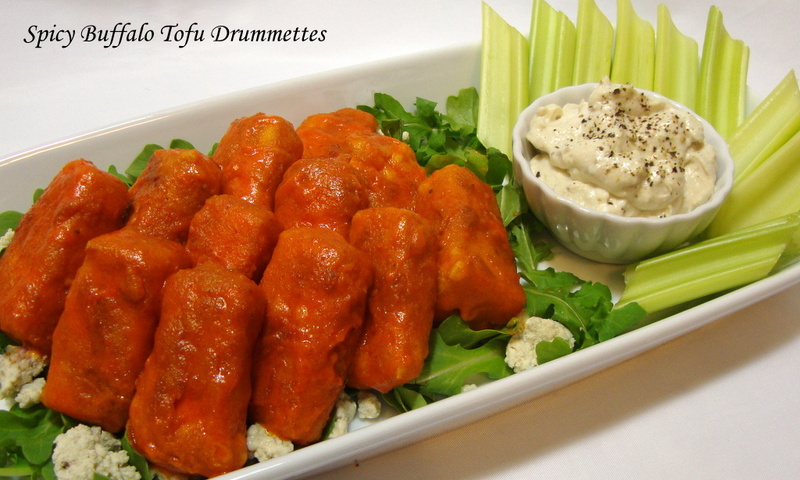 Spicy Buffalo Tofu Drummettes. I served them with a side of Chunky Bleu Cheese Dressing from my Non-Dairy Evolution Cookbook which can be purchased through this website. And they’re gluten-free! Drain and slice the block of tofu lengthwise through the center to create 2 slabs. Lay each slab on its side and slice lengthwise down through the center to create 4 slabs total. Thoroughly press the tofu until it is not releasing any more liquid. This is important: the drier the tofu, the better the texture of the finished dish (this can also be done with a tofu press using the whole intact block and the block sliced after pressing). Now cut each slab into 3 drummettes. Try slicing on a slight diagonal, turning the knife slightly to left on the first slice and then slightly to the right on the second slice so the drummettes are irregular rectangles, for a total of 12 drummettes. This will give them a more natural and less uniform appearance. Line a baking sheet with parchment paper or a silicone baking mat and place the drummettes on the baking sheet in a single layer. Bake uncovered for 30 minutes, turning after 15 minutes. Remove to cool. In a bowl, whisk together the nutritional yeast, milk, mayo, salt and seasonings until smooth. In a separate bowl, add the garbanzo bean flour. Dip each drummette in the milk mixture and then dredge in the flour and set aside on a plate. Replenish the flour as needed. Let the drummettes dry for about 10 minutes and then dredge them in the flour again. In a skillet or wok, heat about ½-inch of oil over medium-high heat until the oil begins to shimmer. Fry the drummettes in the hot oil for several minutes until golden brown. Remove to a plate lined with a paper towel to drain. Meanwhile, melt the butter or margarine and whisk together with the hot sauce until smooth. Just before serving, drizzle the sauce over the drummettes in a bowl and turn the drummettes gently until they are thoroughly coated with the sauce. Transfer to a serving plate and serve immediately with the dipping sauce of your choice (i.e., vegan blue cheese or creamy ranch dressing). This velvety, delicious soup makes an elegant first course or light supper. This recipe yields about 6 cups. If using fresh Brussels sprouts, trim the tough stems and outer leaves. Frozen sprouts should be thawed before using. In a large soup pot, bring the butter, chik'n broth, white wine, Brussels sprouts and onions to a rapid simmer. Immediately reduce the heat to a gentle simmer. Partially cover and cook for 30 minutes. Transfer the mixture to a blender, cover and begin processing on low speed. Hot liquids can expand explosively if the blender is immediately run on high speed, so start on low and hold the lid on the blender with a dish towel for safety). Increase the speed to high and process until smooth. Return the purée to the soup pot and add the nutmeg and white pepper. Stir in the heavy cashew cream. Add salt to taste. Gently cook on low heat until heated through, stirring frequently. 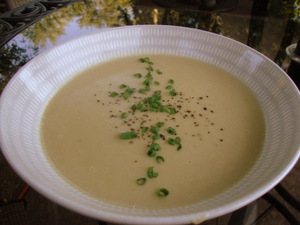 Ladle into soup bowls and garnish with chopped chives if desired.